Only 15 days remaining until Christmas is upon us! Here at Clare Florist we continue our countdown of our top 12 Festive Flowers for Christmas. Our range of christmas flowers online are perfect for sending to loved ones, helping to add a traditional welcoming feel to the home. 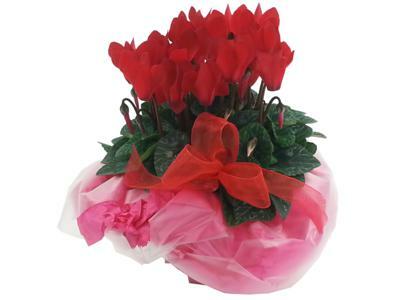 Today we are featuring our Christmas Cyclamen Indoor Plant which is a gorgeous home flower plant to brighten up your home this Christmas time. This stunning Christmas plant is a warm mixture of Reds and Greens. It could almost be compared to an upside down Christmas tree and the red Cyclamens look like gorgeous red fairy lights or red berries. This fantastic new christmas plant from Clare Florist will look fabulous in your home this winter, and is perfect for placing upon your side table or coffee table. Christmas is the time for giving, and with this gorgeous plant we can include a box of chocolates or a hand written note with the flowers as a special treat when you are sending them to family or friends. We have many other Christmas flowers available that we will be highlighting this December during the build up till Christmas.